My Number 1 Rule when I go out to a restaurant is to order something I don’t frequently make at home. I have found, though, that there are fewer and fewer options I choose from, as I am willing to tackle almost anything in my own kitchen. 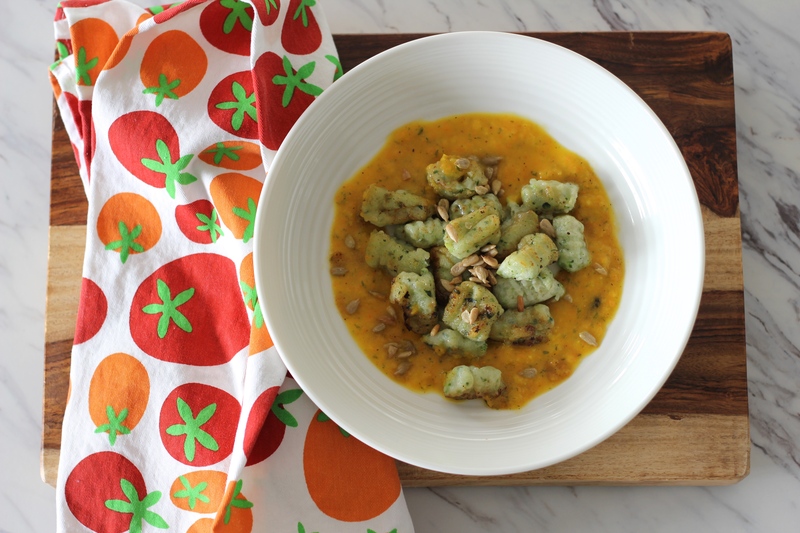 There has been one thing I haven’t tried yet…for the first time ever, I decided to tackle those shifty little potato pillows otherwise known as gnocchi. “Gnocchi” means “dumplings” in Italian, and this girl is always up for a good dumpling. I had some leftover broccolini in the fridge, so I decided to chop that up super tiny and make broccolini-potato gnocchi. What could be better combination, right?! I followed the recipe from Making Artisan Pasta, with the exception of adding the broccoli. 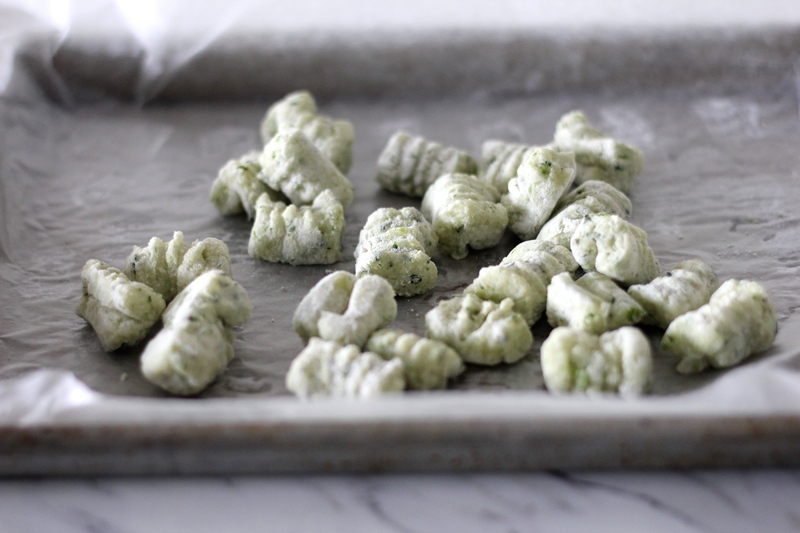 I was really concerned about adding too much flour, and having a tough, play-dough-tasting gnocchi, so I added just what the recipe called for, and worked it until just combined, as recommended. I think I maybe should have added a little more, because they ended up incredibly delicate. Simple ingredients: potatoes, 1 egg yolk, finely chopped broccolini heads, flour, salt and pepper to taste. 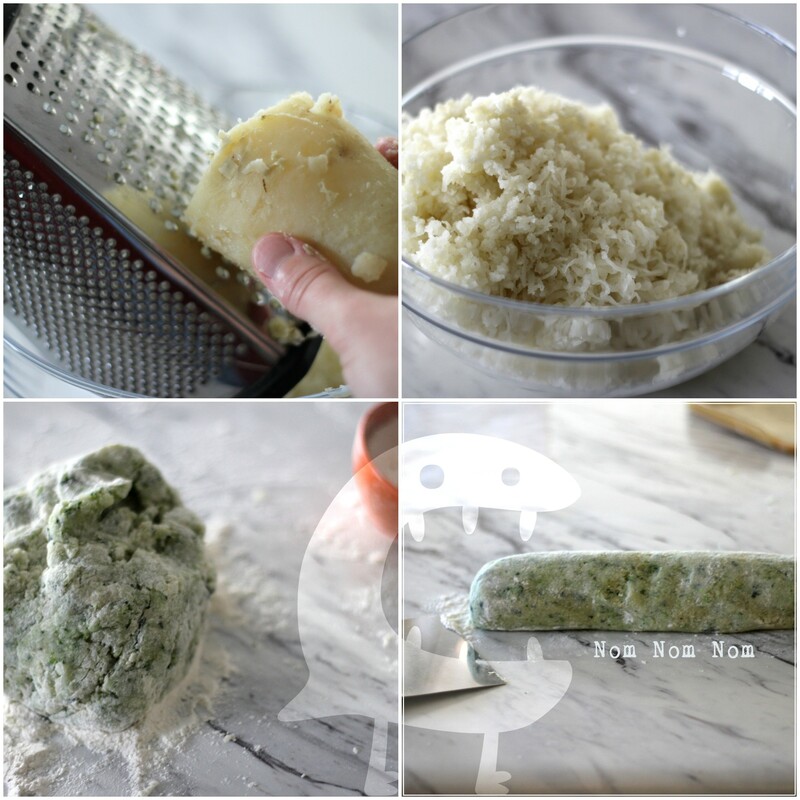 I don’t have a potato ricer, so I googled “How to make gnocchi without a potato ricer”, and the best suggestion that worked for me was using the fine side of the grater. 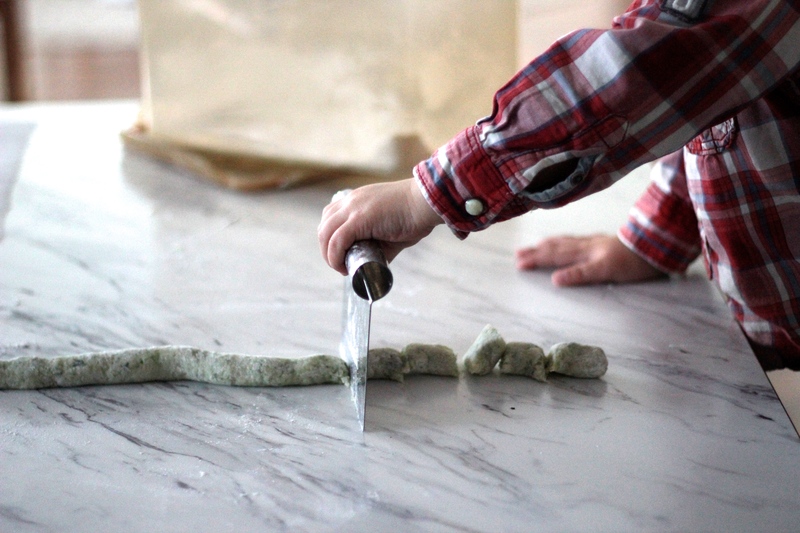 Evenly divide the dough into six portions, then roll each one into little “snakes” and have your little sous chef cut up those little snakes into little squares. He was a pretty happy sous chef. I cooked up a fresh-made portion for dinner that night, and they cooked within 60 seconds tops, and were incredibly fragile and tender, maybe a little too tender. The extra gnocchi got to sleep overnight in the freezer, to be homemade gnocchi at my fingertips for a lunch or dinner. The next day I tried cooking up a portion, and became googly-eyed and nearly swallowed my tongue when the frozen gnocchi pretty much dissolved into a mushy potato blob the second they hit the boiling water. Looking back, I wish I’d have taken a photo of that, because I can laugh about it now. I decided to try cooking the next frozen portion like I would pan-fry a shu mai dumpling, and it worked pretty well, albeit a MUCH shorter cooking time. I quickly threw together a yellow pepper ragú for the sauce, and sprinkled with sunflower seeds, and it was pretty much AH-MAZING. Recipe directly from Making Artisan Pasta, with the addition of 3/4 cup finely chopped broccolini. This book also explains which potatoes are better for making gnocchi and why. I had Russets on hand, so that’s what I used; the book says Russets have denser flesh that requires less flour to thicken. 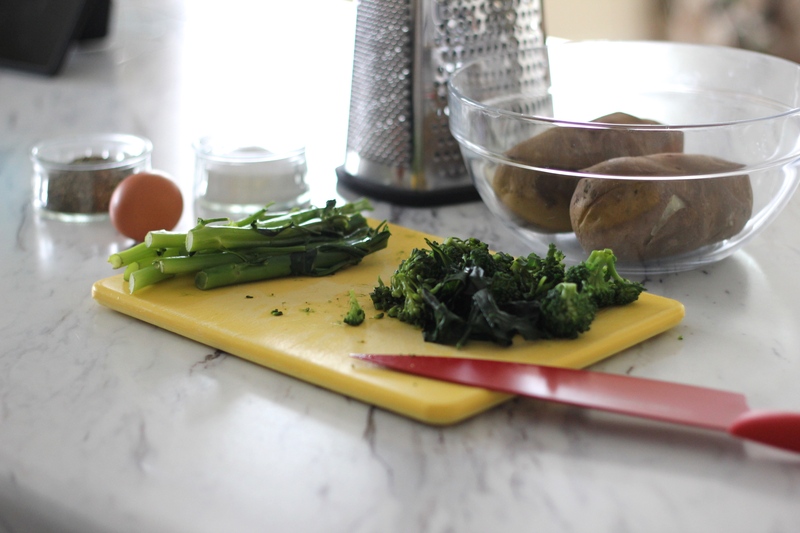 In a large bowl or on a wooden work surface as shown, combine the potatoes with the egg yolk, chives (or finely chopped broccolini), salt, and white pepper. Form the potato mixture into a ring and place the flour in the middle. Gently, using only your fingertips while patting and pinching, mix the flour into the potato mix to make a fairly firm mass that doesn’t stick to your fingers. Work until just combined, as if you were making a pastry dough. The object here is to use the minimum amount of flour and to develop its gluten only enough to stick the whole thing together. Rough handling will result in touch, gluey gnocchi. TIP: Before shaping all the gnocchi, it’s a good idea to test 1 or 2 to make sure the dough is firm enough to hold its shape when cooked. Try cooking a couple in salted boiling water. if they fall apart, which usually happens toward the end of the cooking time, gently pat in an ounce or so (30g or so) of flour. 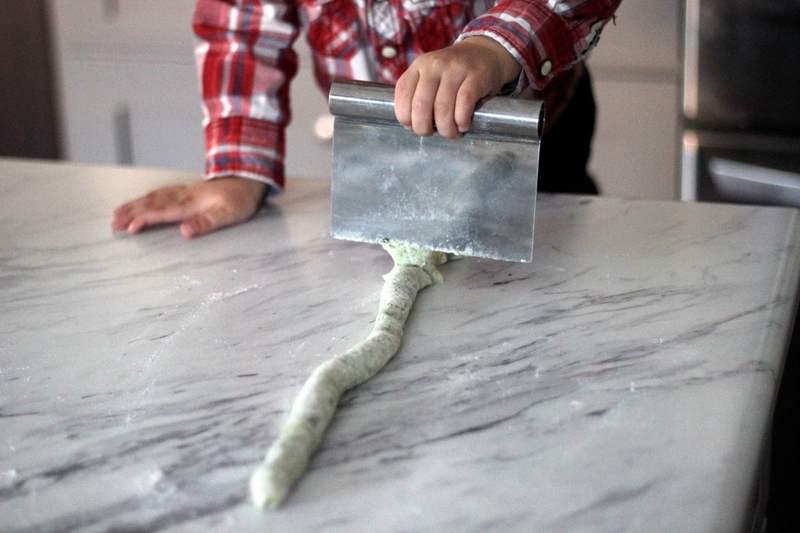 Throw a little flour onto your work surface and gently roll the dough into a thick sausage shape. using a bench scraper, or a knife with a flat blade, divide the dough into 6 portions. Start rolling 1 portion at a time into a “snake,” starting from the center. Use an up-and-down motion while moving your hands toward the outside. Roll each snake until it is about the thickness of your index finger and relatively uniform in diameter. Dust each rope with flour and then roll again to even out the snakes. 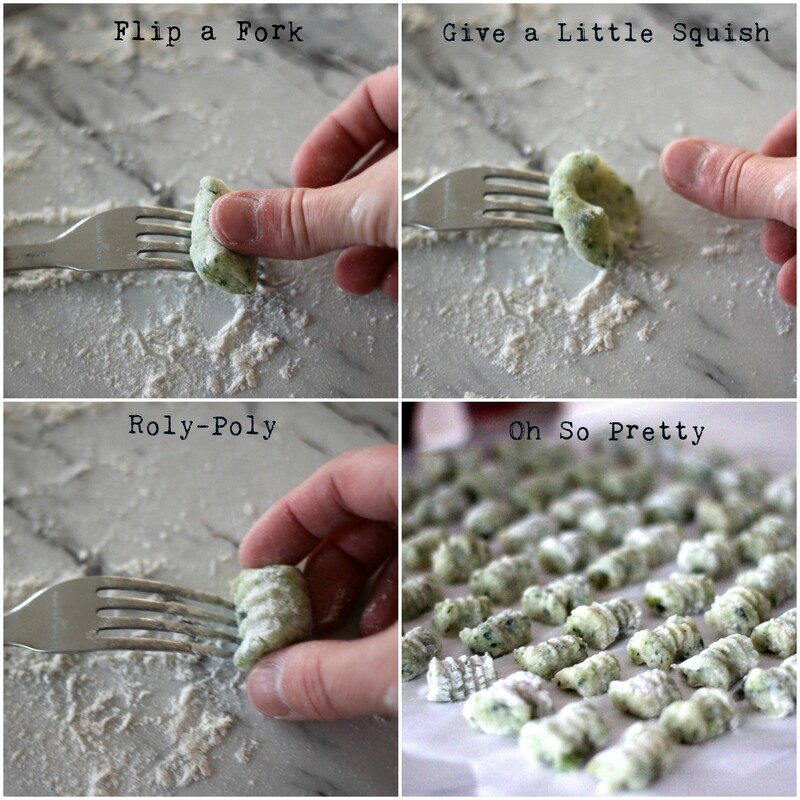 Cut the dough into pillow-shaped pieces 1/2 to 3/4 inch (1 to 2 cm) long to make individual gnocchi. To cook, bring salted water to a boil in a wide, shallow pot. Add the gnocchi, reduce heat to a light rolling boil, and cook he gnocchi until they float the the top. Cook 2-3 minutes longer, or until the gnocchi are cooked through but still firm. Skim them from the water using a wire skimmer or slotted spoon. These gnocchi are too fragile to drain in a colander. Toss gently with melted butter and grated cheese or other sauce, such as fresh tomato ad shredded basil with small cubes of fresh mozzarella, and serve immediately. NOTES: If desired, dust each piece lightly with flour and roll up from the cut edge in a C shape along the outside tines of a dinner fork to form ridged gnocchi. Or, roll up on a ridged wooden gnocchi or garganelli board. Set aside on a board dusted lightly with semolina or cornmeal without touching. 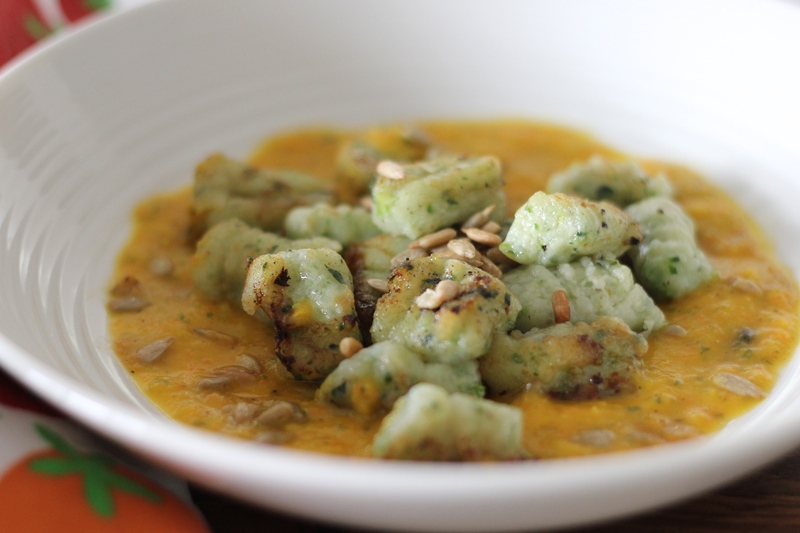 It is best to cook the gnocchi as soon as they are formed, as they will become sticky and soft as the flour is absorbed into the dough. Alternatively, freeze the gnocchi. Do not defrost before cooking. Coat a large sauté pan with olive oil and heat to medium. Add the yellow pepper, onion, and carrot to the pan, sprinkle with salt and pepper to taste, and sauté until just tender, about 5-7 minutes. Pour into a blender and add the parsley and start with 1/4 cup stock/water. 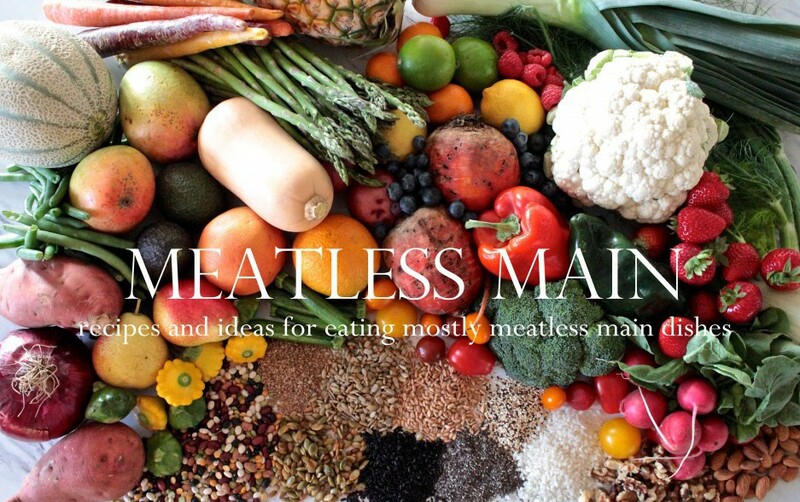 Pulse until you have the desired consistency and texture. A chunkier sauce will require less liquid; a smoother sauce needs more liquid while blending. Next > What Do I Do With ALL THOSE BEANS??! !